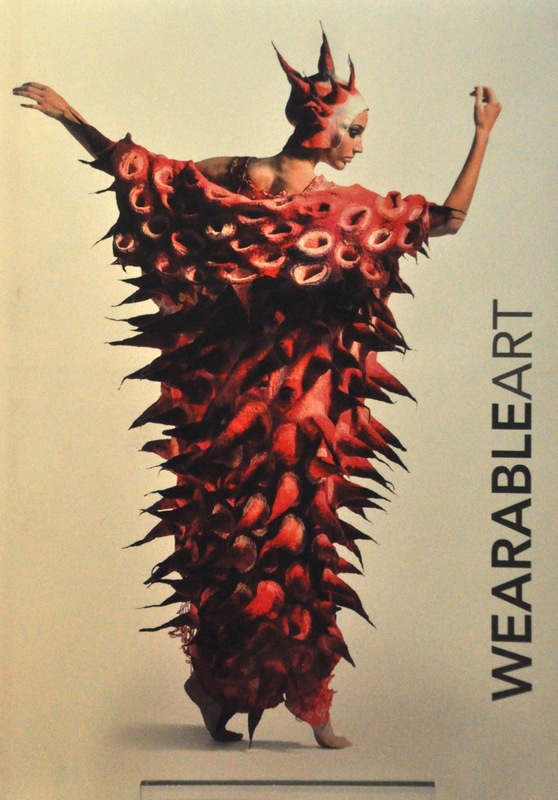 This post will go on and on about the city of Wellington, but if you get bored and think of exiting, I suggest you first scroll down and look at the WOW (World of WearableArt) stuff. It’s amazingly Kiwi. 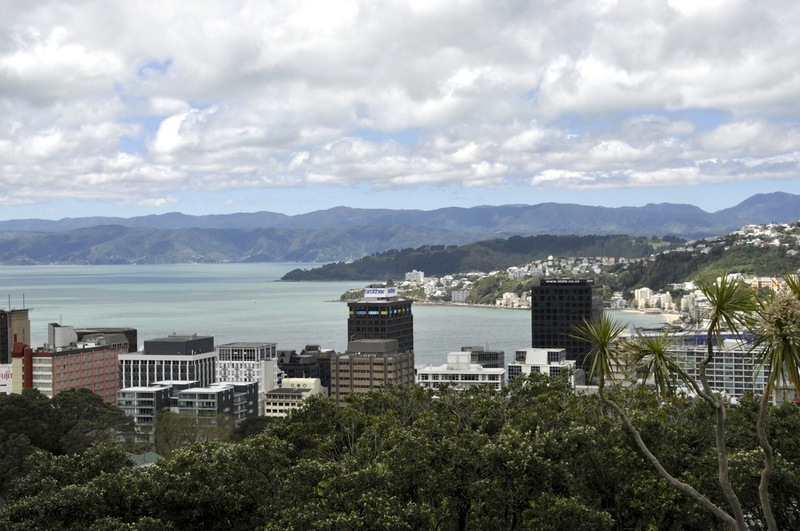 We were thinking that Wellington would be our “roost” city to stay for several months – until we heard that the wind roars down the Sound and intensifies as it squeezes between the skyscrapers. Residents say there is no better place on earth than Wellington on a nice day – but notice the qualifier! Indeed, we encountered some pretty stiff winds; turn a corner and suddenly you are leaning at a 45º angle. The wind is actually a real nuisance – like hanging clothes to dry and hoping they’ll still be there when you get back. background), along with coffee houses, gardens, cable car, etc. Below is some of the interesting architecture. And then there are the delightful building interiors where restaurants spill out into the central halls, and a cable car climbs a hillside – very nice. The cable car goes to Wellington’s very impressive and extensive gardens which occupy basically an entire hill. One takes the cable car up and walks down. Here are just a few pictures. gothic revival library. Sadly one was not allowed to take pictures inside; the parliament building in particular is quite attractive, all in multi-hued matt-finished gray marble that you can see on the outside walls. We watched their Parliament in action from the balcony. It is the English system, the ruling coalition vs the opposition, and it was quite fascinating. Among other things, they were “debating” the coalition’s granting of NZ’s internet infrastructure upgrade to a single company, and it was a cat fight! Questions were put to the minister in charge, and during her answers there were catcalls, shouts, objections, questions – all completely drowning out her answers. It was all very rude. I expected to see people start throwing things at each other, but it just remained verbally rude. I am not sure progress was made. Sound at all familiar???? Of interest was the earthquake-proofing they did to the Parliament building. They drilled holes through the foundation to regularly insert large rubber/spring spacers, then at a distance half-way up the spacer they completely sawed through the remaining foundation horizontally so that the entire upper building was severed from its foundation and instead floated on the spacers. Goodness. I loved Old St. Paul’s Cathedral. It was built in 1866 in the English Gothic style, but with a twist. For the interior, imagine one of the great gothic stone cathedrals of Europe, only now imagine it made out of wood (! ), and then shrink it to a more modest scale. It’s unique and quite beautiful, with lovely stained glass windows from the 18oo’s. 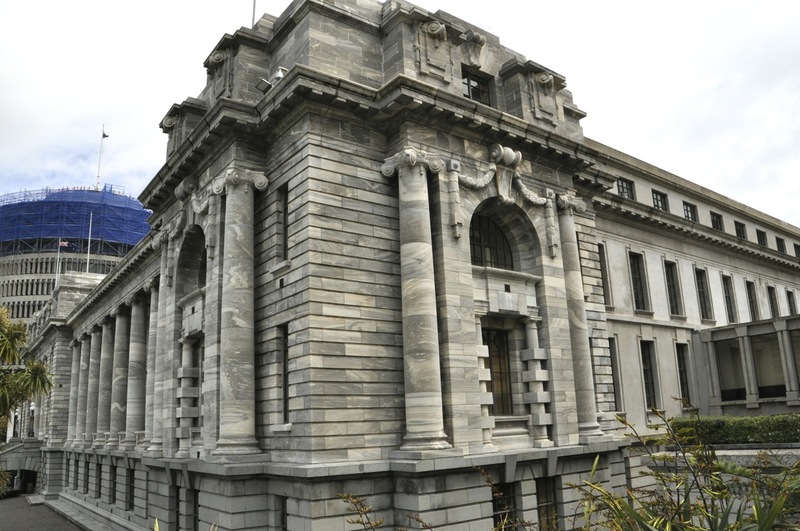 It was almost demolished to build its modern successor; like the US, NZ struggles to preserve its history. OK, now on to the good stuff! Wellington has a very good museum, the Te Papa. It’s big – we didn’t see it all – but we enjoyed it thoroughly. 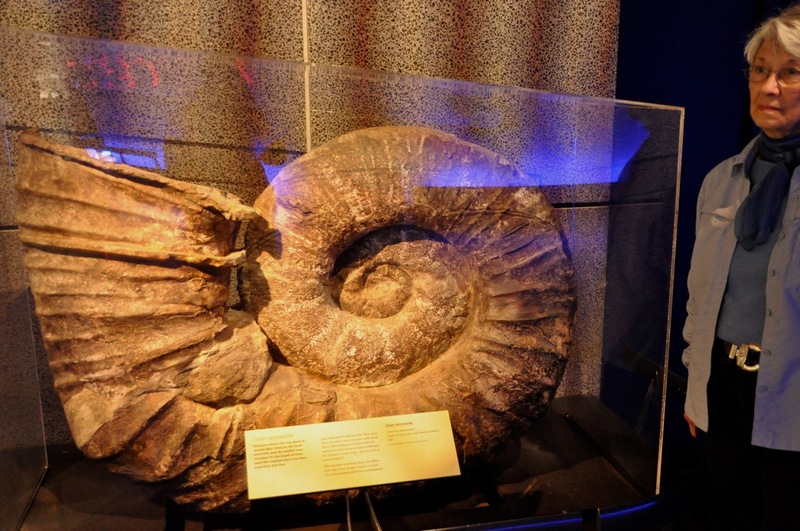 I’ll start with some of the natural history stuff, such as the 140 million-year-old ammonite there on the left, already a fossil before Gondwanaland split up. Next to it is the much younger Ginger …. 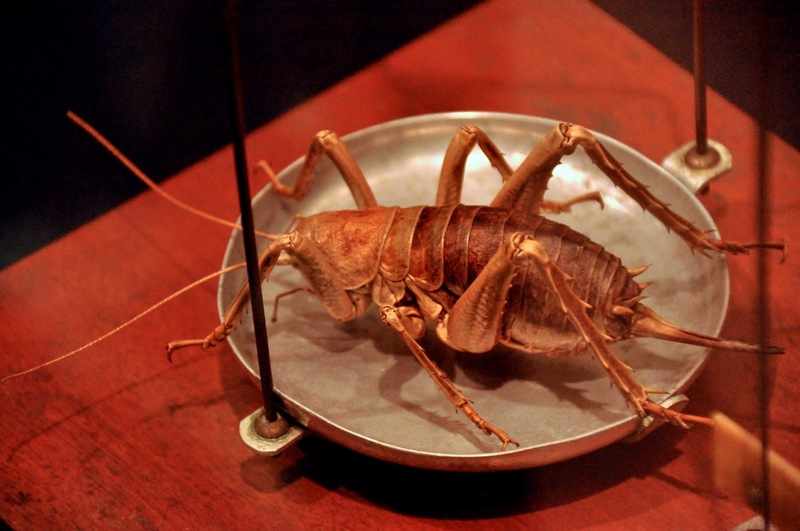 There were great exhibits on volcanoes and sea life and such, but also on lesser-known NZ fauna such as the weta, a large grasshopper-like insect (insects, really – there are variants) that first appeared about 190 million years ago; today they are found mostly in caves, although some species live in trees and shrubs. We could have taken a cave tour to see them in the flesh when we visited the glowworm caves in Waitomo (earlier post), but somehow being in a dark cave with large creepy crawleys scurrying around was not a compelling argument to part with more money. 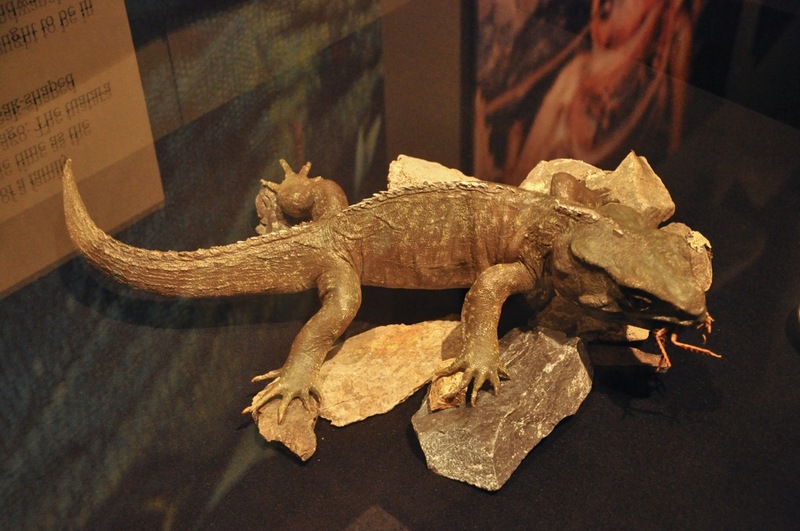 Then there’s the Tuatara, the sole survivor of a family of reptiles that died out with the dinosaurs. No one knows how long these lizards live – some in captivity are well over 100 years and still going strong. Usually these endangered guys are transferred to predator-free islands along with kiwi birds. 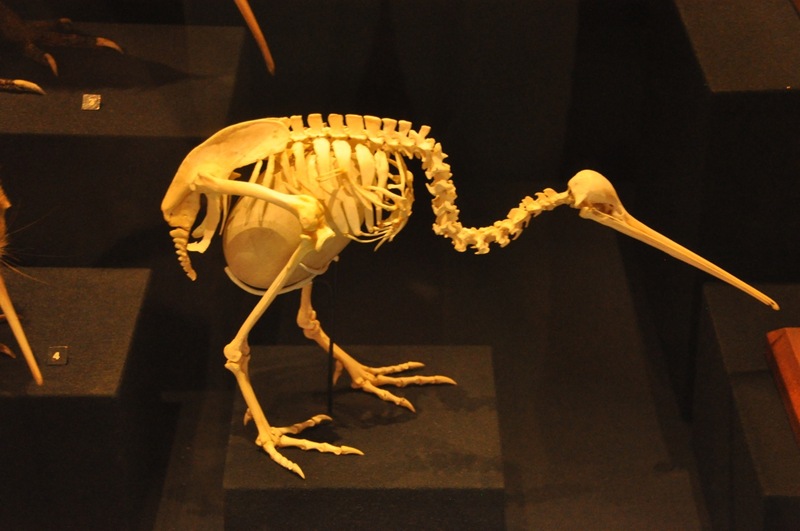 Speaking of which, the museum had a skeleton of a kiwi pregnant with egg, which helps explain why there is only one egg laid per couple … and maybe suggests that predators aren’t the only reason they’re endangered. 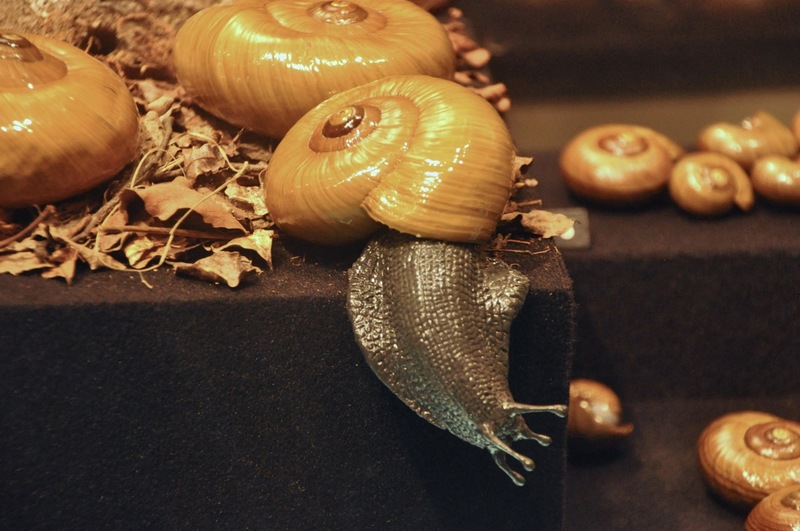 I’ll end the natural history show-and-tell with a picture of the NZ carnivorous snail. What, you say? A meat-eating snail? It’s going to chase down its prey? The name is Powelliphanta, and it IS a big snail, but rather than attacking gazelles it sticks to things like earthworms. I must admit, it tickles me to think of the earthworm wiggling like mad with the snail in hot pursuit…. The Maori exhibit was also good, although there is a certain sameness to Maori exhibits. The details are in fact different, but the overall form and content of the things they did were remarkably similar among the many warring tribes on the islands. There were TV loops of some of the shows (like the Flash Gordon skit), supporting the zany entertaining wild crazy nature of this event. It looked like a lot fun! Here are more outfits. This one, of wood, was by a carpenter in Alaska, his first WOW entry (2006). This one from India combines felting with laser cutting (2010). The rest I’ll just show in a lump. OK, my favorite! 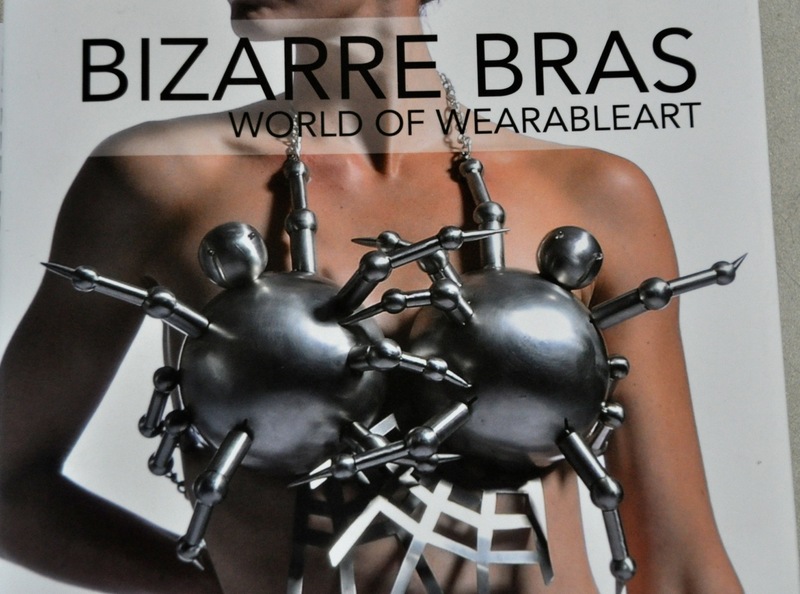 The bra wearable art. Save the best for last! This is a topic that catches my interest, and some of the bras are brilliant. 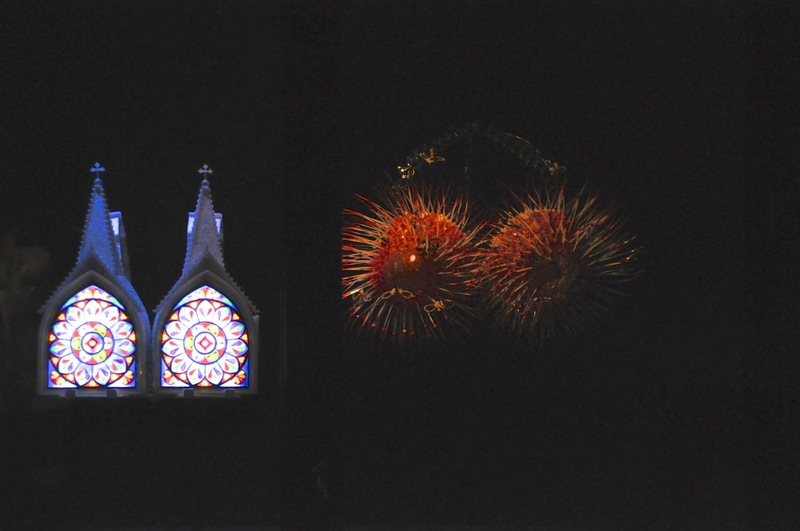 I particularly like the bra on the left – maybe you can’t tell that the bra is a pair of churches (with lit-up rose windows). A comment on breasts as a place of worship. Hmmm. I’m not a religious man, but the idea needs study. I took this picture just before being told not to take pictures, so alas, that is all the (live) bra photos. As I said earlier, the Nelson museum didn’t allow photos. However, a book in the museum was devoted to the topic, and I will share some pictures taken from that book. Apparently many of these bras were featured in the Flash Gordon routine I talked about, which was shown on a TV loop. Flash and his men descend to the stage inside an amazingly accurate and always laughable Flash Gordon rocket. The planet is populated by females wearing bra art, of course, but a tentacled monster has captured the leader of the Amazon-like tribe. The lady is rescued, and everybody dances and sings, then Flash and the leader jet off together to the jubilation of the adoring residents. Beyond campy! And apparently Flash’s buddies have decided to stay behind …. Below are some pictures of bras that give you the idea of this art and all that it comments on. And I believe there is some social commentary here! I particularly like the clever bra strap in the first picture. There are of course many others, but this is enough on Wellington! Next post is the trip to the South Island. We thought the North Island was beautiful. Everyone says we haven’t seen anything yet. Weta Cave is a small shop occupying a corner of Weta Workshop, the company that makes weapons, armor, face (or foot) masks for dwarfs or trolls or Hobbits, as well as scaled city models for the movie industry – in particular, for directors with big budgets like James Cameron or Peter Jackson (Peter helped expand the company). Think King Kong, Avatar, Lord of the Rings, The Hobbit, Narnia, District 9. They will make, say, a metal helmet in all its glory for the close-ups, and a thousand copies in plastic for the armies, and make them all look a little used, dinged and smudged. Their attention to detail is impressive indeed, as are the imaginative thoughts behind, say, the look of weapons in the future or believable elvish design. Not to mention monster creation. They can in fact create anything, from fine jewelry, costuming or creature suits to large-scale tank or other (working) vehicles. 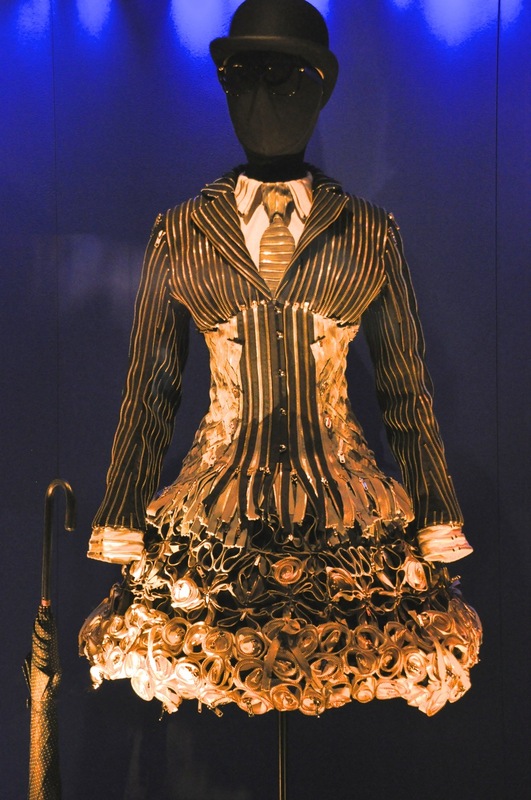 Actually, making these items is just a small part of what they do; in addition to employing a blacksmith and swordsmith and sculptor and painter and mold maker, they in particular employ programmers and computer artists to directly partner with the film director to bring his vision to life, including conceptual design and inventing the technology needed to pull it off. They’ve expanded into many areas, including creating their own animated children’s tv programs. They are sufficiently successful that Weta Cave is on the tourist agenda, probably largely due to the Peter Jackson movies and the big interest in Hobbits and Rings. Weta Cave is free admission – for a reason: all those very realistic plastic weapons and helmets used in the movies? Well, those are for sale … along with very detailed miniature figures downsized from larger models. Would you like to own an exact, detailed, shiny replica of Sting? A pitted, corroded Orc sword like the one used in the movie? I can take pictures in Weta Cave, but pictures are not allowed in the new pay-a-fee tour of the “behind the scenes” Weta Workshop, since there is new-to-the-world secret stuff being created there. We jump at the chance to see the Workshop in action. As it turns out, it is a very limited tour! We was had! It’s one relatively small room divided in the middle, and we walk around the periphery … mind you, the Workshop we’re supposedly touring is 65,000 square feet …. This one room is crammed with stuff, and the (45 min) tour moves too fast to see it all very well, but there are some killer displays of monsters and weapons and such from previous movies, and a discussion of how to paint things to look old and used, or to look like bronze or silver. We get to see how weapons are cut out by viewing through a glass wall the (computer controlled) robotic milling machine slowly going through its paces and staffed by one person, but that’s pretty old technology, really. I ask about 3-D printing, and the answer is that it doesn’t have good enough resolution but they are studying it. We see a few life-size statues of creatures that no one else has seen outside the tour, pretty fantastic one-off’s done for the fun of it – and we talk to the artist making them. So our tour of the Workshop has encountered one room, one milling machine, one painter (our guide), and the sculptor. It has been interesting, but it’s a far cry from a real tour of this very creative cutting-edge Company. OK, enough griping (did I really expect to see someone hunched over a computer designing some movie mogul’s future new monster? A walk-through of workshops and sets? An other-worldly city being put together? Yep! Sigh. So goes Hope.). Let me show you what they have let me take pictures of in the Cave/sales shop. There are 3 trolls outside, 2 of them shown above. There is impressive detail incorporated in these guys, which Weta is famous for; for instance, the hair on the troll’s face (and these monsters live outside in the weather!). The Cave inside is dominated by Lord of the Rings/Hobbit exhibits, which is OK by me. I’ll start by showing some of the weapons. The helmets are very cool. I particularly like the “King of the Dead” helmet, battle-scarred and very authentically old looking. There are two original armor costumes on display that were made expressly for the Lord of the Rings sagas (at some expense!) that never made it into the film. Again, the detail of apparent age and the allowances for limb movement are impressive. 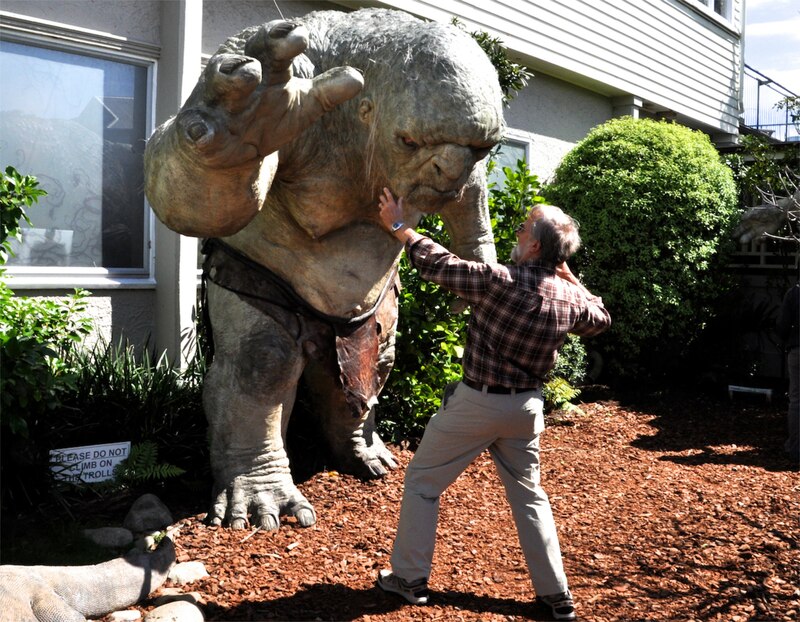 There are a lot of miniature Lord of the Rings/Hobbit statues for sale, all with the Weta fetish for detail. I take pictures of just a few. We must not forget Hobbit feet. 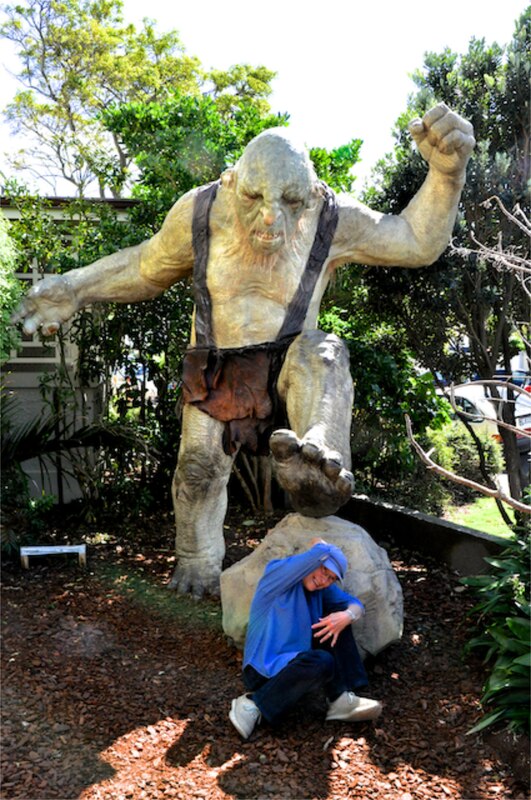 There are also a few life-size statues that are quite impressive, such as Gollum. A few others: Gandalf, elf king, orc. Lutz, leader of the orcs; he is about 8 feet tall and very impressive indeed! This last cute statue is not in the Weta Cave but in a movie theater nearby, the art deco Roxy that has connections to Weta. Notice the small green plants growing on his dirty clothes and feet. 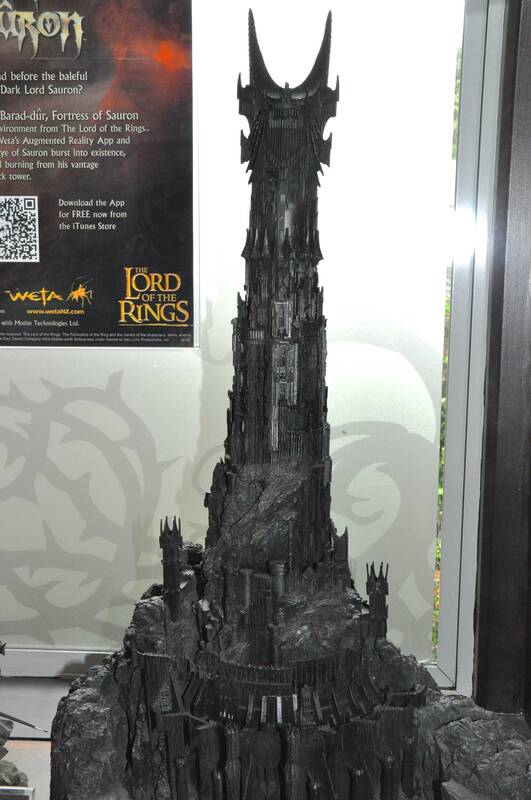 The final Lord of the Rings/Hobbit display is a scale model of the fortress of Sauron. Since Weta has done more movies than Lord of the Rings, there are of course other displays, such as the Faun weapons from Narnia, shown on the left, and weapons from Avatar, shown on the right. There are also weapons and creatures from District 9, shown below. There are other displays, such as from the animated film TinTin, and some I don’t recognize that are quite intriguing and very well done, as shown below. 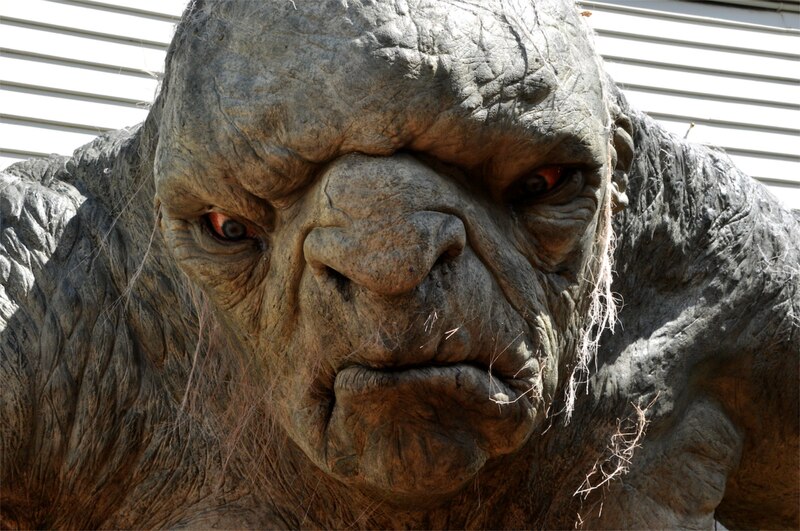 That’s it from the Weta Cave. Next post will be on the city of Wellington.